CAN I DO OBEDIENCE TRAINING WITH MY GREYHOUND? Because most greyhounds are intelligent and eager to please their owners, obedience training is a fun way to make him/her a model citizen. Dallas Obedience Club, Inc. has a training schedule and information online at www.dallasotc.org. Clicker training is included in their classes. For information regarding private instructors, email GALT at info@greyhoundadoptiontx.org. I'VE DONE BASIC OBEDIENCE, WHAT ELSE IS THERE? Many greyhounds also enjoy agility training and competitions. Here's a site with more links about agility training. HOW CAN I GET INVOLVED IN ANIMAL-ASSISTED THERAPY? Our greyhounds bring so much joy into our lives. Their gentle nature and loving disposition make them the best companions. Truly those so blessed should share with the rest! 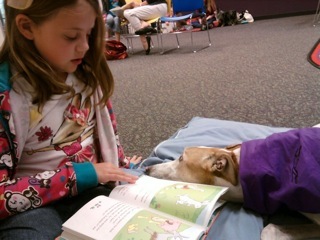 Greyhounds make outstanding THERAPY DOGS. A therapy dog is specially trained to provide affection and comfort to people in need and to remain calm and relaxed in stressful situations. Both dog and handler must pass a test before being certified. Therapy Dog groups go out into the community and provide educational presentations to area schools, comfort and entertainment to local nursing home residents, and encouragement to children with special needs. 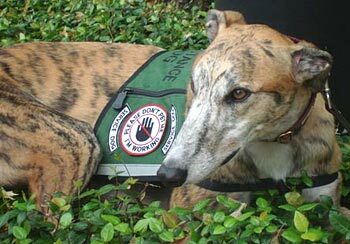 We would love to form an all greyhound therapy team to go out and spread joy throughout the metroplex. If you are interested in training your special companion to be a therapy dog, please contact Cheryl Woolnough (Audi and Belle's mom) at K9companiontraining@gmail.com for more information. Become certified to visit nursing homes, hospitals and schools through Pet Partners Program of the Delta Society, www.deltasociety.org. Certification requires greyhounds to know basic obedience commands and to be comfortable in a variety of different settings. 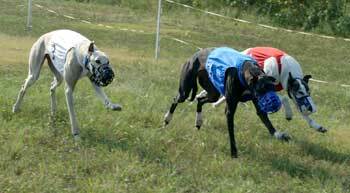 Typically greyhounds, with their gentle demeanor, can be good candidates for this type of activity. CAN I MAKE HOMEMADE DOG TREATS FOR MY GREYHOUND? Frosty Paws is a commercially made "ice cream" for dogs. I never met a dog that didn't like it. This is a homemade version that's always a hit. Makes 18 servings. Puree the banana in a food processor or blender. Add the peanut butter and honey and continue processing until smooth. Add yogurt and process just long enough to blend all ingredients together. Place 18 small paper cups (bathroom size) in a baking pan. Fill paper cups to about 2/3 full. Freeze until solid. Transfer the frozen treats to zip-lock bags for easy freezer storage. Try substituting other goodies for the banana/PB/honey, like 1 cup of pumpking puree, melon/honey, or applesauce/cinnamon. Just remember, carob is fine, but no chocolate! Lure coursing is a humane sport which re-creates the chase of the hare by the pursuing hound. The "bunny" consists of strips of white plastic attached to a continuous loop line that runs through a series of pulleys to simulate the zigzag path of a rabbit on the run. No wagering is involved; the dogs run for fun and the occasional ribbon or trophy. Coursing is not merely a race. Greyhounds and the other participating sighthound breeds are judged not only on speed, but also on enthusiasm during the course, agility in making turns, how accurately they follow the path of the lure, and their endurance in completing the course. Lure coursing is an athletic activity - check with your vet before embarking on this adventure. It is not recommended for dogs who have previously broken a leg. WHAT IS LGRA OR NOTRA RACING? For more information, go to www.gazehoundsintexas.org.